Infantry guns are artillery weapons for the use of infantry units. The designs usually have short barrels which fire a low speed shell. They are lightly built so they are easy to moved around on the battlefield. Very few infantry guns are still used by infantry units. They have been replaced by grenade launchers, light anti-tank weapons and heavier wire-guided missiles. Pack guns are similar to an infantry gun, but mean those guns that are meant to be taken apart for movement. 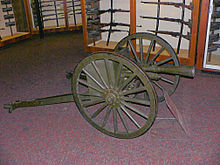 Mountain guns are infantry guns designed for use during mountain combat. Airborne guns are those designed for use by paratroopers. They are easy to move and lighter weight when compared to field guns. Although oxen were used to pull the heavier field and siege guns, some on wagons rather than limbers, they were too slow to keep up with the infantr. Horses were used to pull the lighter pieces, leading to the development of the artillery carriage and horse team that survived until the late 19th century. ↑ The Corps of Royal Engineers, (1860). Aide-mémoire to the Military Sciences: Framed from Contributions of Officers of the Different Services. Volume II. London: Lockwood & Co. pp. 551–552. This page was last changed on 15 March 2013, at 05:08.